I'm going to warn everyone with this release: This will not be for everyone, but at the very least it's one of the more interesting albums we've brought you in a long, long time. Amanda White just released her second studio album, the wonderfully titled Kittens Give Zero Fucks. She's an operatically trained singer that splits her time between New York and Boston. What makes Amanda White unique and different is that her music rocks. It also has this odd sense of humor I wouldn't expect from anyone trained in opera. The line "Every virgin has been unchasted," along with song titles like "Fuckall Rockstar," "Whackadoodle World," and "Where the Hell is Amy?" show that this isn't an artist that takes herself fully seriously. Like I said at the beginning, this definitely won't be for everyone. But, if you want your hard rock with some opera and a sense of humor, you'll probably be into Amanda White. You can listen to "Fuckall Rockstar" below. 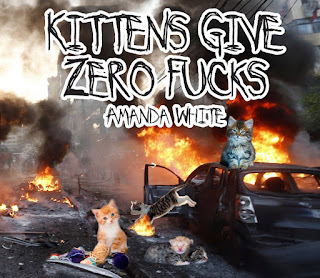 Kittens Give Zero Fucks, the new album from Amanda White, is available now on her Bandcamp. For more on Amanda White, check out her Facebook and Twitter.